"Burnaby - 7260 Edmonds Street"
Photograph of Murdoch McMurray with a fuel truck. 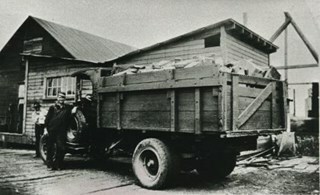 He bought into Edmonds Coal and Wood, 1500 Edmonds Street (later renumbered 7260 Edmonds Street). Photograph of the home of Dugald C. Patterson, Sr., and his family. The house was originally located at 7260 Edmonds Street (near Kingsway). It was relocated in 1955 to 7106 18th Avenue and is a city heritage site. 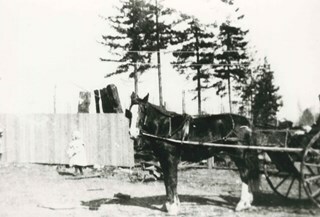 Photograph of horse and wagon standing outside Dugald C. Patterson's Edmonds District home (not visible). The house was originally located at 7260 Edmonds Street (near Kingsway). It was relocated in 1955 to 7106 18th Avenue and is a city heritage site. 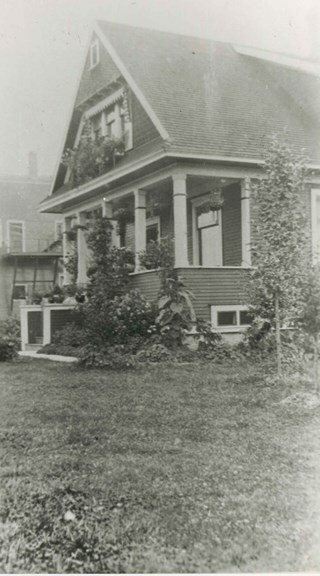 Photograph of the exterior of Dugald C. Patterson, Sr.'s, second Edmonds home. The house was originally located at 7260 Edmonds Street (near Kingsway). It was relocated in 1955 to 7106 18th Avenue and is a city heritage site. 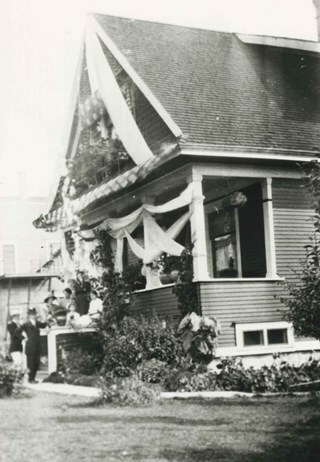 Photograph of the D.C. Patterson house decorated with bunting for the visit of Prince Arthur, Duke of Connaught. A group of unidentified people can be seen gathered on the front steps. This home was built in 1910. The house was originally located at 7260 Edmonds Street (near Kingsway). It was relocated in 1955 to 7106 18th Avenue and is a city heritage site. 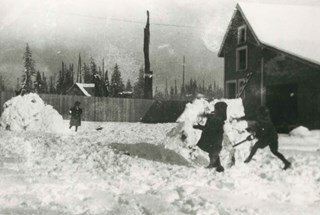 Photograph of three children throwing snowballs and playing in the snow outside the D.C. Patterson house in the Edmonds district. The house was originally located at 7260 Edmonds Street (near Kingsway). It was relocated in 1955 to 7106 18th Avenue and is a city heritage site. 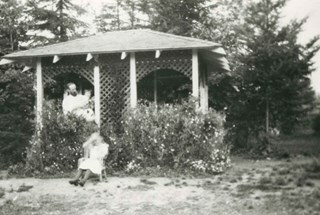 Photograph of D.C. Patterson, Sr., with two children standing in the gazebo at the family home. 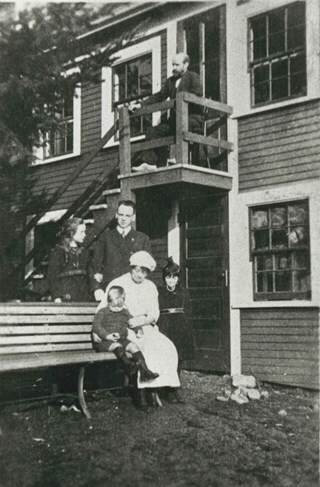 Mr. Patterson is holding a child inside the gazebo, and another child is seated in a small chair outside it. The house was originally located at 7260 Edmonds Street (near Kingsway). It was relocated in 1955 to 7106 18th Avenue and is a city heritage site. 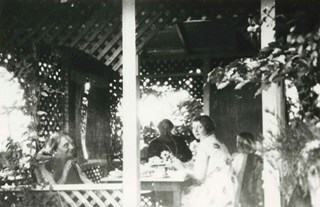 Photograph of a luncheon group in the summer gazebo of the Patterson family home. The house was originally located at 7260 Edmonds Street (near Kingsway). It was relocated in 1955 to 7106 18th Avenue and is a city heritage site. 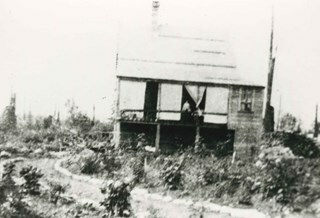 Photograph of the exterior of the home of Dugald C. Patterson, Sr., and his family. People are standing outside, and a man, possibly D.C. Patterson, is seated at the top of the stairs. The summer gazebo can be seen on the left of the photograph, and there is laundry on a line at the bottom right. The Patterson family house was originally located at 7260 Edmonds Street (near Kingsway). It was relocated in 1955 to 7106 18th Avenue and is a city heritage site. Photograph of Dugald C. Patterson, Sr., resting in a sun porch. The Patterson family house was originally located at 7260 Edmonds Street (near Kingsway). It was relocated in 1955 to 7106 18th Avenue and is a city heritage site. 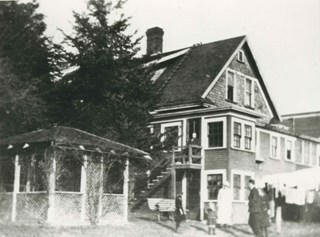 Photograph of the side of the D.C. Patterson house in the Edmonds district, looking northwest. The house was originally located at 7260 Edmonds Street (near Kingsway). It was relocated in 1955 to 7106 18th Avenue and is a city heritage site. Houses, the road, and railroad tracks are also visible. Accession information describes it as a view from the Gray Block of the Edmonds District. Photograph of Patterson Family. 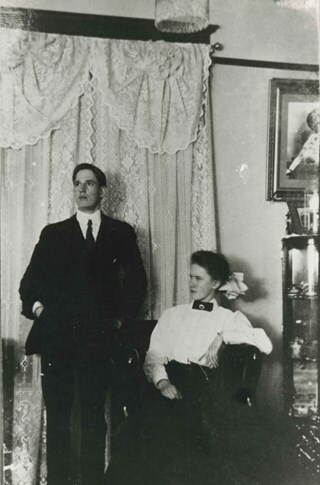 Sitting, left to right: Dugal C. Patterson, Jr. and Frances Mabel Patterson. Standing, left to right: Jean Patterson, Bill Patterson and Frances Patterson. On balcony: Dugald Campbell Patterson, Sr. (injured in a Glasgow ship yard during the First World War). The house was originally located at 7260 Edmonds Street (near Kingsway). It was relocated in 1955 to 7106 18th Avenue and is a city heritage site. 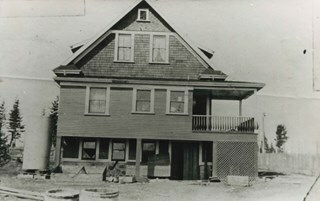 Photograph of the home built by D.C. Patterson. The house was originally located at 7260 Edmonds Street (near Kingsway). It was relocated in 1955 to 7106 18th Avenue and is a city heritage site.. 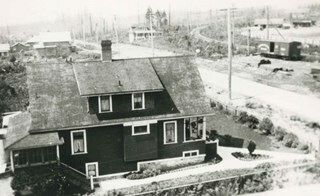 Photograph of the exterior of the D.C. Patterson home in the Edmonds district of Burnaby. The house was originally located at 7260 Edmonds Street (near Kingsway). It was relocated in 1955 to 7106 18th Avenue and is a city heritage site. 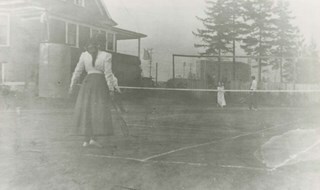 Photograph of three people playing tennis on the court at the D.C. Patterson house in the Edmonds district. The house was originally located at 7260 Edmonds Street (near Kingsway). It was relocated in 1955 to 7106 18th Avenue and is a city heritage site. 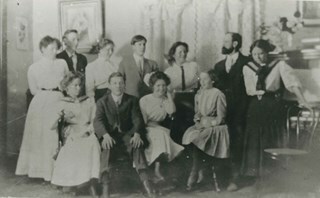 Photograph of eleven members of the D.C. Patterson family inside the family home in the Edmonds district. The house was originally located at 7260 Edmonds Street (near Kingsway). It was relocated in 1955 to 7106 18th Avenue and is a city heritage site. 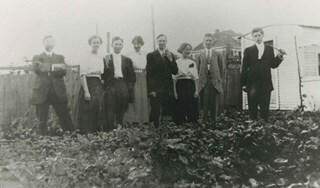 Photograph of eight members of the D.C. Patterson, standing in the garden outside the family home in the Edmonds district. The house was originally located at 7260 Edmonds Street (near Kingsway). It was relocated in 1955 to 7106 18th Avenue and is a city heritage site. 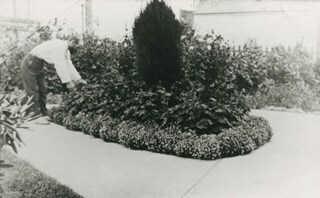 Photograph of D.C. Patterson, Sr. working in the garden of his home. The house was originally located at 7260 Edmonds Street (near Kingsway). It was relocated in 1955 to 7106 18th Avenue and is a city heritage site. 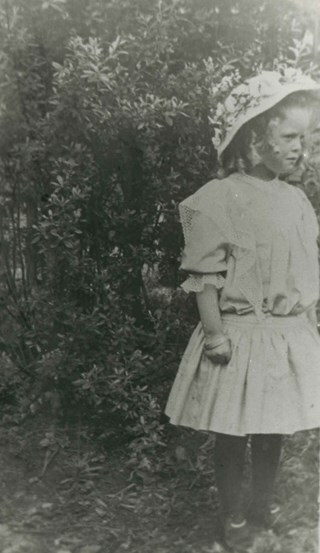 Photograph of a girl wearing a bonnet standing next to a small tree in what may be the D.C. Patterson family garden. The identity of the girl is not known. The house was originally located at 7260 Edmonds Street (near Kingsway). It was relocated in 1955 to 7106 18th Avenue and is a city heritage site. Photograph of an unidentified man and woman in the living room of the D.C. Patterson house. The house was originally located at 7260 Edmonds Street (near Kingsway). It was relocated in 1955 to 7106 18th Avenue and is a city heritage site. 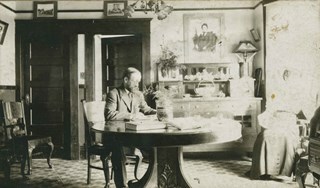 Photograph of Dugald C. Patterson, Sr., reading at the dining room table of the Patterson family home. The photograph was taken from the parlour, and the pantry door and sewing room door (partly open) can be seen in the background. The portrait at the back right is of D.C. Patterson Sr.'s mother, and the woman seated next to the window is his wife, Frances Mabel. The Patterson family house was originally located at 7260 Edmonds Street (near Kingsway). It was relocated in 1955 to 7106 18th Avenue and is a city heritage site. Photograph of Dugald Campbell Patterson Sr sitting on a chair in a brightly lit room. An annotation on the back of the photograph reads: "B. Patterson (father) sitting in sun room where he used to write poetry. No date." Photograph of the interior of a house identified by accession register, catalogue record and inscription as Patterson house, possibly built in the 1890s. The location is on either on Patterson Street (where the Patterson family first lived in Burnaby) or, more likely, Edmonds Street (where they later moved to). The photograph shows the hall area, with two display cabinets showing fine china in the left corner. There is a large rug on the floor, and a mirror by what seems to be the side of a staircase. The house is overall decorated in a late Victorian style. An annotation on the back of the photo reads: "Interior picture of the Paterson [sic] home. Located on Edmonds St., Bry. c. 1890's." The house was originally located at 7260 Edmonds Street (near Kingsway). It was relocated in 1955 to 7106 18th Avenue and is a city heritage site. Photograph of a snow scene taken from the porch of the Patterson house on Edmonds Street. Noted in the catalogue record is how the snow covered house in the distance was the only neighbour of the Pattersons at that time. The house was originally located at 7260 Edmonds Street (near Kingsway). 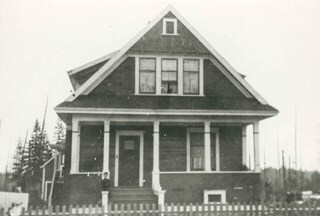 It was relocated in 1955 to 7106 18th Avenue and is a city heritage site.